This CAD formats listing is broken into four areas; native formats, geometric modeling kernel formats, neutral formats, and tessellated formats. ‘Precise’ refers to CAD models, whereas ‘Tesselated’ refers to polygonal models. See end of this page for further clarification. Please note that ‘TransMagic Read’ and ‘TransMagic Write’ capabilities refer to TransMagic Expert. See specific capabilities of each core product at the bottom of this page. 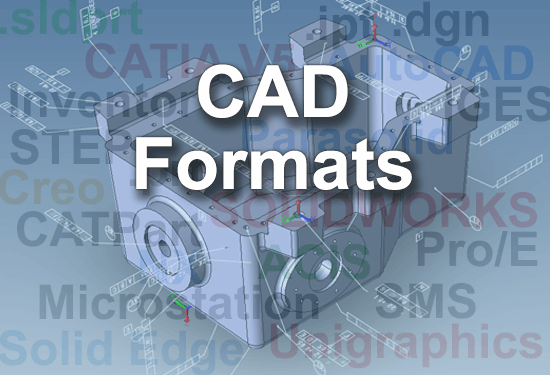 Native CAD Formats refers to formats that are proprietary to specific CAD systems. If you have the ability to read these formats, they will have the most information and be more accurate than Geometric Modeling Kernel CAD formats or Neutral CAD formats. 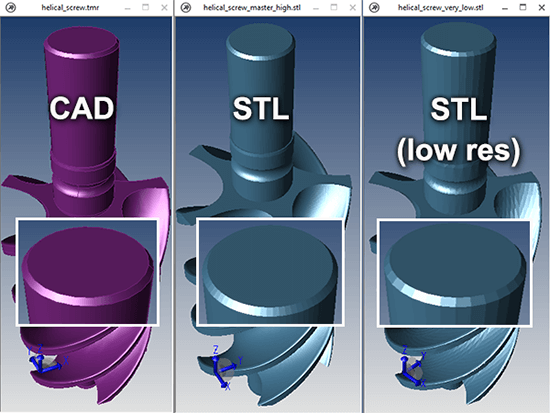 .prt, .jt, .j_t Precise Siemens NX up to NX12, JT up to 10.2 JT is a compressed visualization format ideal for viewing large assemblies. .par, .asm, .psm Both Siemens ST10 Best exported as X_T. Geometric Modeling Kernel formats are what Native CAD formats are built upon. Because these formats have stricter criteria, they tend to be a better source of geometric information than STEP or IGES. .sat, .asat, .sab, .asab Both Spatial Technologies R1.5-R2019 (R29) R1.5-R2019 (R29) SAT is ascii, .sab is binary, and .asat and asab are specifically for assemblies. ACIS supports Non-Manifold geometry. .x_t Precise Siemens Up to 31.0 Up to 31.0 Parasolid supports only manifold geometry. Read more about Manifold and Non-Manifold here. .xcgm Precise Dassault All All XCGM is the native kernel format for the CATIA CGM geometry kernel. CAD formats are often converted to polygonal formats such as STL and OBJ for the purposes of 3D printing, animation or game development. Polygonal formats are tessellated, or faceted, containing none of the engineering information found in Brep CAD models, such as weight or volume. .pdf Tesselated Tetra 4D Up to 2018 SP2 Up to 2018 SP2 3D PDF is an ideal format for sharing information with people who don’t have a CAD system or a CAD viewer; all you need to view a 3D PDF file is Adobe Acrobat Reader, which almost everyone has. .stl Tessellated 3D Systems STL is the default format for 3D printing. STL files can be optimized using export settings, or via the Polygon Reduction tool. ‘Precise’ models are CAD Brep (Boundary Rep) models, with precise geometric boundaries and capable of mass properties calculations. ‘Tessellated’ models are polygonal, or Visrep (visual representation), useful for visualizing models or assemblies, though faceted in nature. Read more about Brep vs Visrep here. The figure at right (moving from left to right) shows a CAD model (in purple), a faceted STL model, and a very roughly faceted STL model. Notice that there are no straight lines, or ‘facets’ on the CAD model. CAD models are geometrically precise, which is why they are sometimes referred to as ‘precise’ models. Tessellated or faceted models, on the other hand, are composed of triangles, and are mere approximations of the model, even if it they are so finely faceted that it is sometimes difficult to tell. All TransMagic core products read polygonal, neutral, geometric modeling kernel and native formats. TransMagic EXPERT writes polygonal, neutral, geometric modeling kernel and native formats. TransMagic PRO writes polygonal, neutral and geometric modeling kernel formats. TransMagic SUPERVIEW writes only polygonal formats. All TransMagic core products can read PMI from CATIA, NX, CREO, SOLIDWORKS and JT files. TransMagic Superview can write PMI to 3D PDF. TransMagic Pro can write PMI to 3D PDF, STEP AP242 and TMR*. TransMagic Expert can write PMI to 3D PDF, STEP AP242, JT and TMR*. All TransMagic core products also have the ability to write PMI to Edges so that the PMI information can be viewed in any CAD or polygonal format. Find the Write PMI to Edges checkbox in Settings. *TMR is TransMagic’s native Precise Brep format.